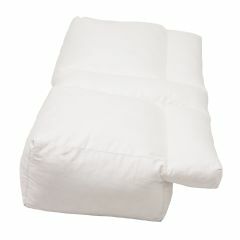 AllegroMedical.com presents The Better Sleep Pillow - (Gel Fiber Fill) Arm Tunnel Pillow. Perfect pillow for every type of sleeper. Uniquely designed with a lateral recess along the entire length of the pillow and a center tunnel for alternative arm positions. Provides support for your arm, head and neck, reducing shoulder discomfort, numbness and tingling.-Aligns your neck and spine properly, keeping your airways open, reducing snoring and sleep apnea. Proper spinal alignment prevents morning stiffness. Decreases morning stiffness and shoulder pain. Opens airways, cease the cause of snoring and sleep apnea.-Support your body frame for proper alignment of the spine. No more numbness or pain. Reduces lower back and neck pain. Center and side recess to accommodate your arm, reducing pressure. Construction: -Constructed of high quality, hypoallergenic cozy fiber fill gel polyesteR. Sleep with arm under pill. side sleeping. stomach sleeping. arm under pillow. 1- What is the material of the cover? 2- Is shipping to LA free on this Pillow?